How much does it cost to travel to Taiwan? How much money will you need in Taiwan? NT$2,391 ($78) is the average daily price for traveling in Taiwan. The average price of food for one day is NT$427 ($14). The average price of a hotel for a couple is NT$2,743 ($89). Additional pricing is in the table below. These average travel prices have been collected from other travelers to help you plan your own travel budget. How much money do I need for Taiwan? Taiwan is officially governed by the Republic of China and is located off the coast of southeastern mainland China. The island has a population of over 23 million and it is one of the most densely populated places in the world. There are many different scenic areas in Taiwan. 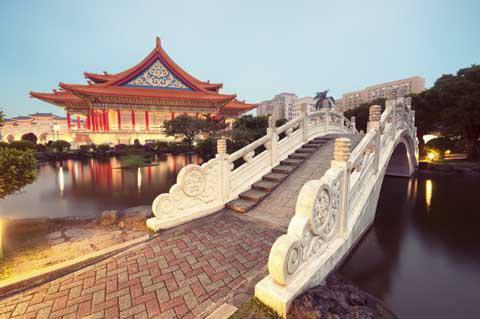 Taipei is the entertainment center and has a lot of energy and vibrant events. Despite being so densely populated, Taiwan also has plenty of natural beauty such as impressive mountains and beautiful forests. The population of Taiwan is 98% Han Chinese, with the remaining 2% being from the original indigenous tribes. 84% of the population is considered Taiwanese local residents whose ancestors migrated during the Ming and Qing Dynasties. 14% are mainlanders whose families fled to Taiwan after the PRC's establishment in 1949. Taiwan has a marine tropical climate, which means that summers are hot and humid and winters are cool. Summer runs from June to September and winter is from November thru February. Northern Taiwan has the coldest temperatures and is prone to rain year around. Southern Taiwan is drier during the winter months. Typhoons may hit the island during the fall or winter months. Taiwan has a chain of mountains running through the central island from north to south. Most of the population lives on the west coast which is much flatter and at a reduced risk for typhoons, which predominantly hit the east coast. In general, Taiwan uses the Minguo calendar which counts the years since the establishment of the Republic of China in 1911. To determine the current year in AD simply add 1911. For example, 2015 is 104 in Minguo. Months and days are kept according to the standard Gregorian calendar, although the lunar calendar is used to determine most holidays. Several languages are spoken in Taiwan including Taiwanese, Mandarin, Hakka and several other Asian languages. There are also several aboriginal Austronesian languages spoken. In the North most people speak Mandarin as this is where you will find the highest concentration of "mainlanders". Taiwanese is also spoken there. In the south Taiwanese is more common. The Taiwanese currency, the New Taiwan dollar, can be exchanged both on the island and off of it. There are no restrictions. You will generally get the best rate if you wait to exchange your money after you arrive. Most banks will exchange money and there is a 24 hour currency exchange window at the airport. As is true throughout most of Asia, night markets are a popular activity in Taiwan. Night markets offer visits plenty of entertainment, shopping and food. Most are open air markets that are packed full of vendors selling anything and everything. Larger cities usually have a night market daily, but smaller cities may only have them once a week. There are any number of interesting souvenirs in Taiwan, but some of the most popular things to buy include Jade, electronics such as computers, tea, and lingzhi. Lingzhi is a Chinese herb that has many supposed health benefits without many side effects. It tends to be expensive as it has gained a reputation throughout East Asia. If you decide to buy Jade it is important to make sure what you are buying is real. Do some research before you spend a significant amount of money on anything. Looking for a hostel in China? Traveling alone to Beijing or Hong Kong or want to party in Shanghai? The Taroko Gorge: This beautiful gorge is located on Taiwan's east coast near Hualien. It is a dramatic 19 kilometer long canyon that is well worth the trip. It is surrounded by Taroko Gorge National Park which was first designated a national park in 1986. National Chiang Kai-shek Memorial Hall: This memorial is a symbol of both the Republic of China and Taipei. The courtyard hosts many national celebrations as well as protests. There is a large bronze statue of Chiang Kai-shek and a museum that focuses on his life. Taipei 101: This skyscraper, officially known as Taipei International Financial Center, is 101 stories and 508 meters high. It's located in the Zinyi District of Taipei and is the second highest skyscraper in the world. It also has the world's second fastest elevators and is worth a trip for the views alone. Taiwanese cuisine comes mostly from mainland Chinese cuisine and you can generally even find regional specialties from the mainland all over Taiwan. It is possible to find Szechuan, Hunan, Beifang and Cantonese food throughout. Seafood is a staple in Taiwan, and many dishes also include eggs. Fruits are common and delicious, as the climate allows a diversity of options to grow. Beef Noodles: This Tawainese staple is a noodle soup that is made with pieces of very tender stewed beef. It is also flavored with a few pickles. Oyster Omelet: This dish is made from eggs, oysters, and the leaves of a local chrysanthemum. It's flavored with a sweet red sauce on top. Taiwan Sausage: Taiwan sausage is most often made from pork and is similar to the Cantonese laap cheong, although not as sweet. While laap cheong is usually eaten with rice, this version is almost always eaten on its own with garlic.